There are some pretty big differences. What’s it like teaching in a charter school vs. public school? Is the grass greener at charters? Do public school teachers feel more pressure? Or vice versa? If you’re thinking about switching from one to the other, read on. Here’s the lowdown on everything you need to know but were afraid to ask! Charter schools are public schools of choice. They operate without many of the regulations traditional public schools must adhere by. Charter schools, however, are accountable for upholding promises made in their charters including academic achievement, financial management, and organizational stability. If a charter school is mismanaged or test scores are poor—they’ll be shut down. Public schools are traditionally run by a school district and governed by a school board. Yes, some charters offer slightly better pay than public schools but there’s a catch. Charter school teachers work an average of 210 days (195 school days with 15 for PD) while public school teachers work around 180. As for the day-to-day, public school teachers put in eight/nine hour days and charter school teachers can work as many as twelve. But charter school teachers can’t do much to raise their compensation to match the amount they work. Most charter schools don’t allow unions, making collective bargaining for higher wages near impossible. In fact, some charter school teachers make much less than their public school counterparts. When it comes to charter and public schools, the perception is that public schools have large classes and charter schools have smaller ones. It really depends on how big the schools are because there’s no “standard” for either. 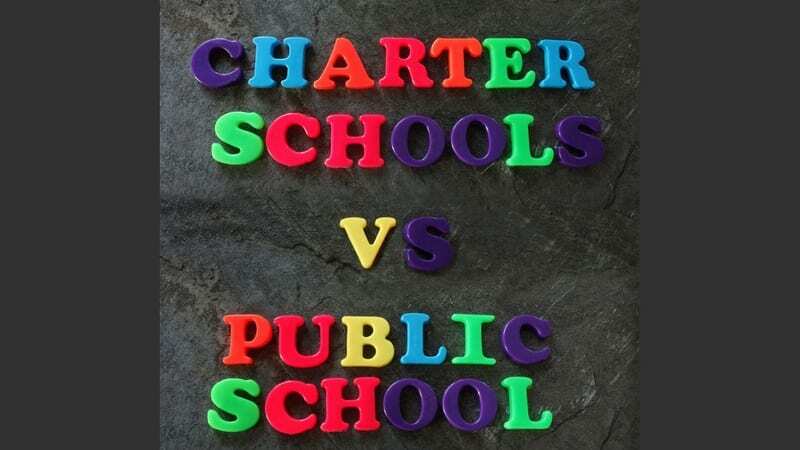 Yes, charter and public schools are both publicly funded. They receive per-student operating funds from the state just like public schools. The difference? Charter schools receive limited funds from local taxes or municipal bonds. Instead, they rely on grants, awards, and donations for supplemental funding and capital expenditures. The perception is charter schools have more money per student. But, depending on the area, the opposite might be true. Public schools are funded by state taxes and federal education grants and the money is disbursed to schools/districts on a per-student basis. Here’s the biggest difference: charter schools are accredited by a private board and public schools are accredited by the state board of education. Yes, charter schools abide by the same state academic standards as public schools YET they have flexibility when creating their curriculum. Many charter schools can offer a unique curriculum or approach to teaching. Public schools have academic standards (i.e., test scores) and curriculum requirements set by each state that they must follow. While charter school rules can mean more freedom with what you teach in the classroom, they can also mean that you’ll work a longer day, commit to extracurricular activities unpaid, and take on other responsibilities generally not expected of public school teachers. Public school teachers must meet all state certification requirements. Charter school teacher requirements vary between states. Some states require charter schools to hire teachers with state credentials while others do not. But, charter schools can set their own education and training requirements. While most charter schools are non-profit, about 13 percent are run by for-profit companies, meaning they manage their budget so that there is leftover dollars, or profit at the end of the school year. Teachers should know that in some states, working for a for-profit charter will make you ineligible for loan forgiveness. Because charter rules vary so widely from school to school, it can be tough to make generalizations about what it’s like to teach in a charter school vs. public school. The key is to do your research and find out the particular differences between charter schools and public schools in your area.